Becky Albertalli returns to the world of her acclaimed first novel, Simon vs. the Homo Sapiens Agenda, in this warm and humorous story of first love and senior-year angst. Of course this was amazing. I loved being in Leah’s head. I love her snark and sarcasm and RBF. I loved that we got so much Simon and Bram. I loved Leah’s mom. I loved the story and the ending and the Harry Potter references and the Doctor Who reference and the everything. There is not one thing about this that I didn’t love. Leah is unabashedly loud, potty-mouthed, overweight, bi, and insecure. She’s a fabulous drummer in a band, a band that almost breaks up because Leah calls out a member for making a racist comment. But when it comes to her love life, she’s a bowl full of jello. No one knows she’s bi. She’s super-frustrated by the girl who seems to be teasing her. Does she want to be her friend or more? This is a love story, albeit an unconventional one. The dialogue is snappy and non-young adults may get lost in the modern slang. The scenes move along at a rapid clip. Stuff happens. It’s senior year and a close-knit group of friends have chosen their colleges, for the most part. There’s some drama around whether long distance relationships will work. There are clueless cling-on boyfriends. Leah has to deal with her mother’s boyfriend. With the exception of the jealous boyfriend and the prom setting, Albertalli largely avoids clichés. This is a nerdy crowd. Leah draws anime. Enough said. Some characters are really drawn out, though I would have liked to know others better. I could really see Leah, though I don’t know anyone like her. I would have liked to get a clearer picture of the girl of her desires. Her close friend Simon is well-defined, but I couldn’t get a read on his boyfriend Bram. The ending called for a bit of suspension of disbelief, but it worked. Probably because Albertalli made her prom date such a doofus. All told, Leah in the Offbeat was a thoroughly enjoyable and quick read. I’m not a young adult. It would be nice to think there were tight groups of friends this diverse: black, bi, gay, questioning, white, hetero, though I haven’t seen it with my young adult. His friends check a couple of the boxes. Maybe it’s aspirational. Maybe other high schools are this diverse. In any case, the diversity of the characters made the book interesting. Once again, I’m weak for Becky Albertalli’s books. After reading “Simon vs. the Homo Sapiens Agenda” and being totally in love with it, “Leah on the Offbeat” was a must-read for me. I pre-ordered it on March 26th–the day I finished the first book–and spent nearly a month obessesing over the day it would arrive. When it arrived two days ago, I dove in immediately. From the beginning, I was hooked. Leah is a character who really takes nothing from anyone and is totally aware of who she is, bisexuality and all–except for one thing: is she falling for the girl she never thought she would even LIKE? With college nearing and prom on her brain, Leah is completely confused about who she likes and who she doesn’t like, and this is very relatable for any teenager. 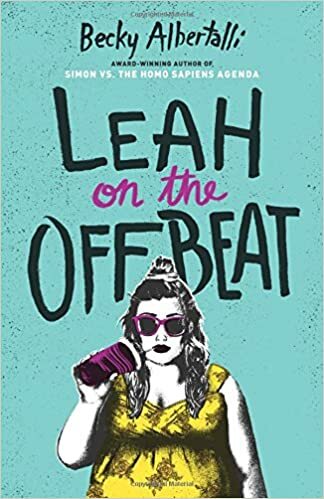 Leah on the Offbeat will take you through a wild ride with Simon Spier’s best friend, Leah Burke, a high school senior who is not yet out to her friends but is also unmistakably and painfully falling head over heels for one of them. This is one of the best books I have ever read. Unlike other LGBT books, this is so much easier to digest as opposed to darker, heavier plots and characters. It’s a lot more relatable, in a way that really makes your heart clench and your head just want more. It is a must-read for everyone, especially LGBT teens and young adults like myself. Once I started, I could not put it down, and that’s really saying a lot. It’s the perfect mix of heartfelt and hilarious and just brutally honest, and the way it’s written just makes you want to read beginning to end with no break. Leah is a very sarcastic and witty character, and her classic deadpan lines are spot-on and make you giggle a little, and her point of view makes you see things in an entirely different light. She’s quirky and uses every reference to fanfiction and fan art each chance she gets, and that’s not something you often read in a book. It’s definitely unique, unafraid of telling the story of a realistic teenager, even mentioning body image and the need to feel beautiful in your own skin, and those awkward moments and kisses everyone regrets. I actually shed a few tears towards the middle and end. It’s definitely an emotional roller coaster, especially when you can just feel Leah’s pain and anguish as she realizes she’s falling madly for someone who may not even like her back, and quite frankly, Leah is not too thrilled that she’s falling hard, either. I was a mess when I closed it for the last time (maybe not the TECHNICAL last time). Becky Albertalli has done it once again. She’s written a masterpiece that will stick with many of us readers. Well done, Albertalli. You’ve won us over again. Please read Leah on the Offbeat. It’s an experience worth having. Even if this isn’t your sort of thing. You just might be in for a huge surprise.